Firefighters made steady progress over the weekend in battling a wildfire that destroyed 16 structures as it raged through Southern California's Cleveland National Forest. The Holy fire was at 22,700 acres early Monday with containment at 52 percent. Slightly cooler conditions helped firefighters who have been protecting lives and homes in the Lake Elsinore area for about a week. "The weather out here in California seems to be cooling down today and over the next couple days, and that should hopefully help firefighters get even more containment," said Lynne Tolmachoff of the California Department of Forestry and Fire Protection. "They should make better progress over the next couple of days." A compilation of the most captivating photos and videos posted to social media from the Holy Fire, which is burning thousands of acres southeast of Los Angeles. 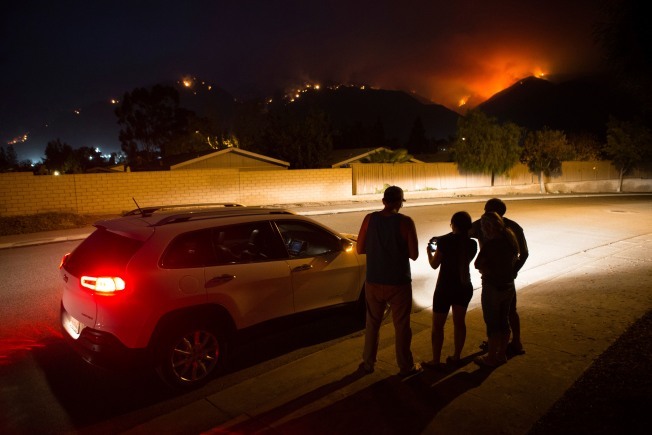 Flames still edged towards a retirement community wedged between the Santa Ana Mountains and 15 Freeway north of Lake Elsinore, prompting voluntary evacuation orders for 1,317 residential units in a retirement community. People living in the Trilogy Glen Ivy community were put on notice to leave, according to Cleveland National Forest fire commanders in a warning issued at noon. Residents of the development's single-family homes and condos who have trouble driving in the dark were advised to leave now in a message posted on the Trilogy Glen Ivy website. The Holy Fire — named for Holy Jim Canyon, where it began last Monday — is one of a dozen large blazes burning across California as the state sees earlier, longer and more destructive wildfire seasons because of drought, warmer weather attributed to climate change and home construction deeper into forests. With firefighters beginning to get a better handle on the blaze, they began to lift evacuation orders over the weekend for areas previously in its path. More than 20,000 people were reportedly told to evacuate at one point.